Pauline Wilkinson and Mauro Migliorelli- "We started our cruising life in 1986, left Australia and cruised Indonesia, Singapore, Malaysia, Thailand, Borneo, Philippines and Hong Kong on S.V. "Lorelei II", a hard chine, Breekveldt steel sloop, built in New Zealand. 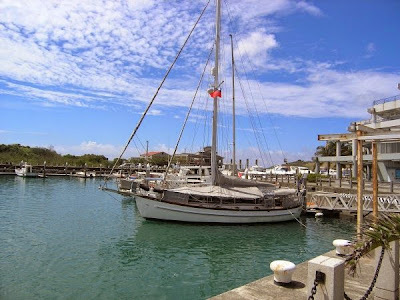 The second Lorelei was a Tayana 37 cruised in the U.S.A and Mexico from 1996 to 1998. S.V. "Shadow of Lorelei" is a Lord Nelson 41, built in 1986. She cruised the U.S. West coast and South Pacific, New Zealand and Australia with her previous owners. Mauro fell in love with her in Brisbane in 2004." You can read all about their adventures on their very good blog. 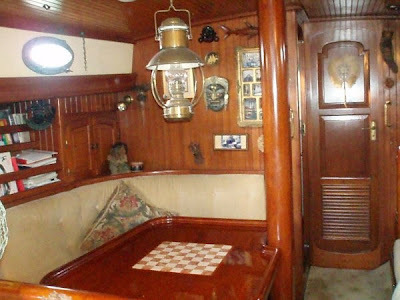 Accommodation; Beautiful sold teak cabinets and bulkheads in all 4 cabins. Two private staterooms, one forward with large queen size bed adjacent to main head, and one aft with double bed and private vanity. Separate pilot berth cabin adjacent to cockpit. Solid teak cabin sole throughout accommodations. Toilet Lavac Manual toilet with Henderson pump and 12VMacerator pump. Full length tent awnings in 3 pieces, Sunbrella , Sunbrella sail covers. Fortress Aft anchor. Over 1000' anchoring/ mooring lines for emergency and/or distress situations. Stainless steel standing rigging , 8 and 10 mm 1x19 wires (checked and replaced where necessary by professional rigger 2009). All winches, mast and boom mounted and in cockpit are 2-speed and self-tailing. 6 various fire extinguishers, fire blanket in galley.